This is a tall evergreen coniferous trees species that is found from southeast Alaska south to northern California. Tall tree, up to 90 m tall; bark greyish-brown to purplish, scaly, thin; young twigs glabrous; main branches of tree noticably long and horizontal with drooping branchlets. Needles sharp, flattened; standing out in all directions; pungent. 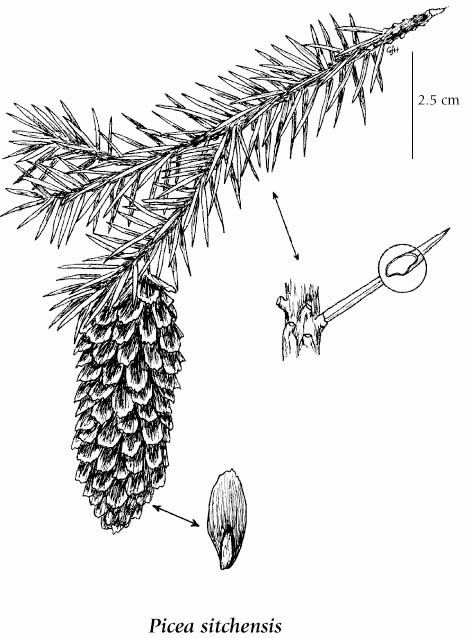 Seed cones 5-9 cm long, reddish-brown to yellowish-brown, scales rounded and finely irregularly toothed at tip; pollen cones red. Hybridizes with P. glauca and P. engelmannii (see notes under P. glauca and P. engelmannii). Moist to mesic slopes and river terraces in the lowland and montane zones; common in extreme W BC; N to SE AK and S to N CA. A shade-intolerant, submontane to montane, Pacific North American evergreen conifer. Occurs in hypermaritime to maritime cool mesothermal climates on nitrogen-rich soils. Avoids moisture-deficient and nutrient-deficient soils. Its occurrence increases with increasing latitude and precipitation and decreases with increasing elevation and continentality. Forms pure, open-canopy stands along the outer coast on sites affected by ocean spray and brackish water, and in advanced stages of primary succession on floodplains. Usually associated with black cottonwood, western hemlock, or western redcedar. Most productive on fresh and moist, nutrient-very rich soils within very wet cool mesothermal climates. Characteristic of hypermaritime mesothermal forests.